The pefect chocolate, comfort food dessert to round out our meal just had to be a brownie. Of all chocolate desserts, they have to be the one I crave most. And swirling in some peanut butter? I’m completely sold. Everyone loved these – and had seconds! The only things I did differently from the original recipe was that I halved the recipe and used a box mix for the brownie base. Preheat the oven to 350˚ F. Prepare brownie batter according to package directions and pour into a 9×9″ baking pan. Combine the cream cheese, peanut butter and sugar in a bowl with an electric mixer. Beat on medium-high speed until completely smooth. Blend in the egg and vanilla until incorporated, scraping down the bowl as needed. Drop spoonfuls of the peanut butter mixture over the brownie batter in the pan, creating a cobblestone appearance. 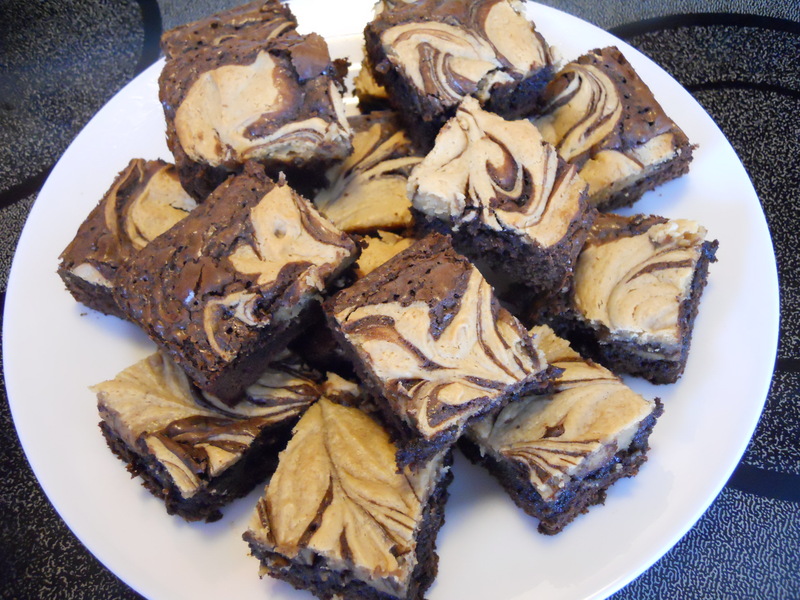 Use a knife or wooden skewer to gently swirl together the peanut butter mixture and brownie batter. Bake 30-35 minutes, until the center is just set. Transfer to a wire rack and let cool to room temperature. Cover and refrigerate until well chilled before slicing and serving.